The July 2017 issue of Nature Chemistry is the 100th and the Editorial celebrates this milestone. I decided to have a little fun while writing it and was inspired by this story from @Helena_LB about including song titles from Metallica’s Black Album into one of her talks. So, the first job was to find an album’s worth of song titles that could feasibly be included in the Editorial. Looking for some suggestions, I asked one of the other editors on the team (Gav), but the track listing of Nevermind by Nirvana would have been somewhat challenging… (‘Lithium’ would have been easy, ‘Territorial pissings’ somewhat tricky and ‘Smells like teen spirit’ downright difficult). Since Nature Physics published a Joy Division-inspired cover in 2016, I’ve been a little envious (OK, consumed with jealousy), but the track listing on Unknown Pleasures would also have been hard to incorporate into an Editorial. (As an aside, if you are not familiar with the back-story to the cover of this album, then this is a great read). So, if not Joy Division, how about the band that followed: New Order? I’m a New Order fan – I’ll admit that one of my ringtones is Blue Monday (and as another aside, if you haven’t seen this Orkestra Obsolete version, you *really* should). Looking through all the albums, the track listing of Republic seemed to be the most amenable to being hidden in roughly 800 words of a chemistry/publishing-themed Editorial. The tracks are as follows: Regret, World, Ruined in a day, Spooky, Everyone everywhere, Young offender, Liar, Chemical, Times change, Special, Avalanche. Although you’d think ‘spooky’ might be one of the hardest to work in, that one turned out to be pretty simple thanks to the 1,000th Article featuring ‘one-thousand’ in its title. The most challenging were ‘young offender’ and ‘liar’… but I managed to pull together a first draft and they didn’t stick out like a sore thumb. I also got ‘Republic’ and ‘New Order’ in there too. After Gav was done with it, he had managed to add the record label: ‘London’ and also the studios where the album was recorded: ‘Real World’. Here’s the published version with the 15 words/phrases highlighted. 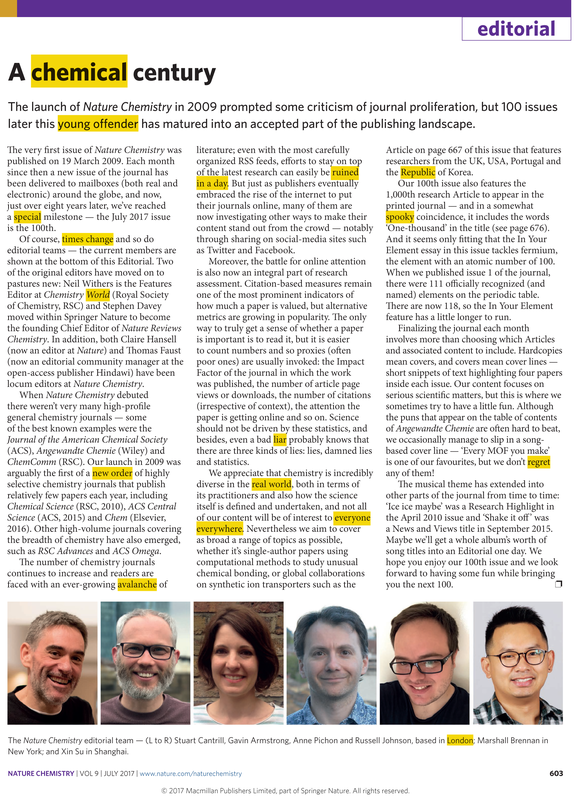 And just for good measure, ‘rise of the internet’ makes another appearance in a Nature Chemistry Editorial (see number 13 here). This entry was posted in Fun, Publishing and tagged 100, chemistry, easter eggs, editorial, joy division, music, nature chemistry, new order, rise of the internet, song titles, writing. Bookmark the permalink.